G.T.E.V. D’Lustigen Isartaler would like to invite you to our Fahnenweihe to be held the weekend of November 16-18, 2018. 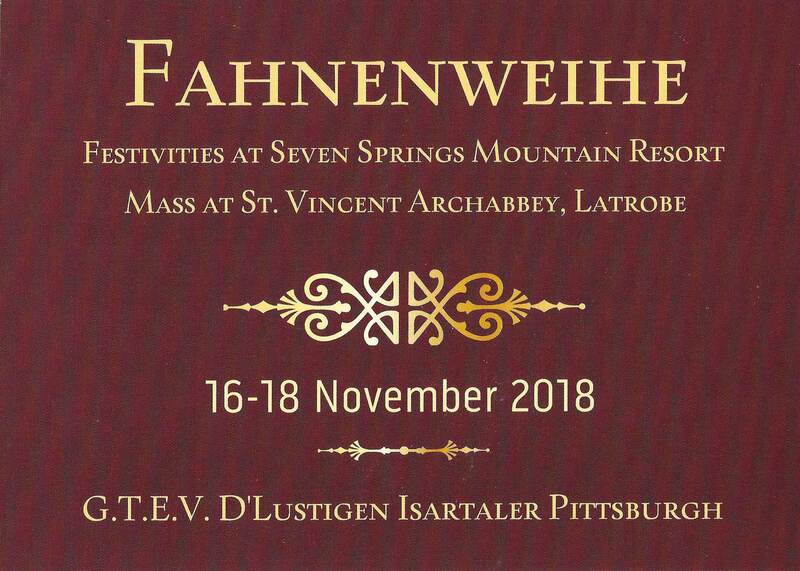 We are thrilled to host this event at Seven Springs Mountain Resort and Saint Vincent Archabbey where the actual Fahnenweihe Mass will take place. As you know, a Fahne is the heart of a Verein and we have been planning many years for this, and now our dream is coming true. We would be honored if you joined us for this special event in these beautiful settings. We look forward to a weekend filled with Brauchtum, Volksmusik, Tanz und Trachtenkameradschaft. The Fest begins with a welcome party/Heimatabend on Friday evening. The band Mädel Jäger will provide entertainment, but we hope all our talented musicians will bring their instruments as well! At 3pm, Saturday afternoon, our Fahnenweihe Mass, at St. Vincent Archabbey, which is located on the campus of St. Vincent College in Latrobe, will take place. An evening banquet and festivities at Seven Springs will follow. We are thrilled that our Patenverein S.T.V. Bavaria’s chorus will help lead the music at the Mass, and Siasswasser Tanzlmusi will be playing for our evening festivities. A Sunday brunch is available for purchase at the resort for those that want to continue celebrating. All the necessary forms and hotel information will be available on our website at: http://isartalerpittsburgh.org/fahnenweihe/. Please contact us with any questions, IsartalerFahne@gmail.com. We look forward to celebrating this momentous occasion with you in November!